Full Fujitsubo exhaust system, titanium. 650cc injectors although maybe higher. Miltek Turbo back 3in exhaust system with high flow sports cat and resonator. Whiteline front and rear droplinks. Exedy Hyper Multi-plate clutch and flywheel assembly. Tarox Sport Japan rear discs with Tarox Rally+Corsa pads. Brembo front and rear Callipers. Trackday use:- Speedline Corsa Type 2113's 17in in gold with Toyo R888's. Scoobyworld front splitter in black. 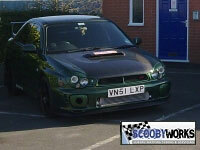 Scoobyworks Re-map by Neil producing 380bhp at 1.4bar.